RAPID CITY, S.D. — A state prison inmate has been placed on escape status. 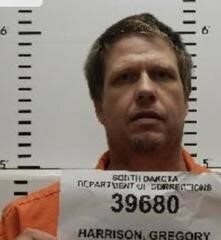 Gregory Harrison, 47, left the Rapid City Community Work Center on Wednesday to go to his work release job. He did not return to the work center from his job site. Harrison is 5 feet 11 inches and weighs approximately 200 pounds. He has blonde hair and blue eyes. He is serving multiple concurrent sentences for grand theft and forging fraudulent checks. If you see Harrison, you’re urged to contact local law enforcement immediately.